Discussion in 'Breaking and Major News about Scientology' started by CommunicatorIC, Dec 13, 2017. 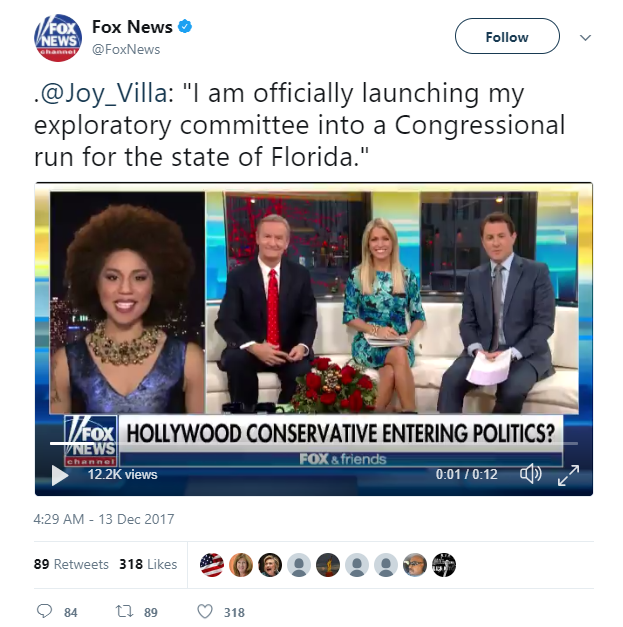 Scientology member Joy Villa is officially launching her exploratory committee into a Congressional run for the state of Florida. Go to Twitter link for video. 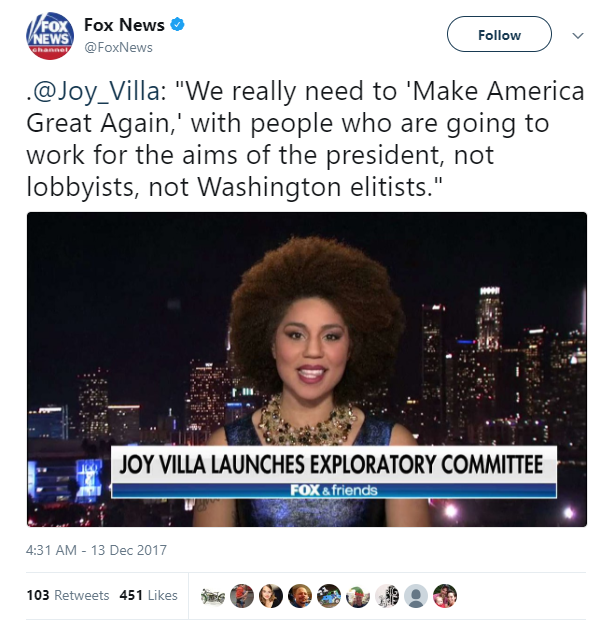 Scientology member Joy Villa launches exploratory committee for Congressional run. Again, go to Twitter link for video. Singer Joy Villa, who famously wore a President Donald Trump-themed dress to the 2017 Grammy Awards, said back in October that she was mulling a possible run for Congress. Wednesday morning on "Fox & Friends," Villa announced that she is launching an exploratory committee to look into a possible run in Florida. "I'm looking everywhere from Jacksonville all the way down to Miami," Villa said, declaring that it's time to get lawmakers in Congress who will actually get things done. The Washington Examiner has a lengthy story up. It looks like they were prepared ahead of time. based on a very painful lie, a cynical betrayal. can improve man. We can show the old gods false. Congressman Charlie Crist is a Democrat now. 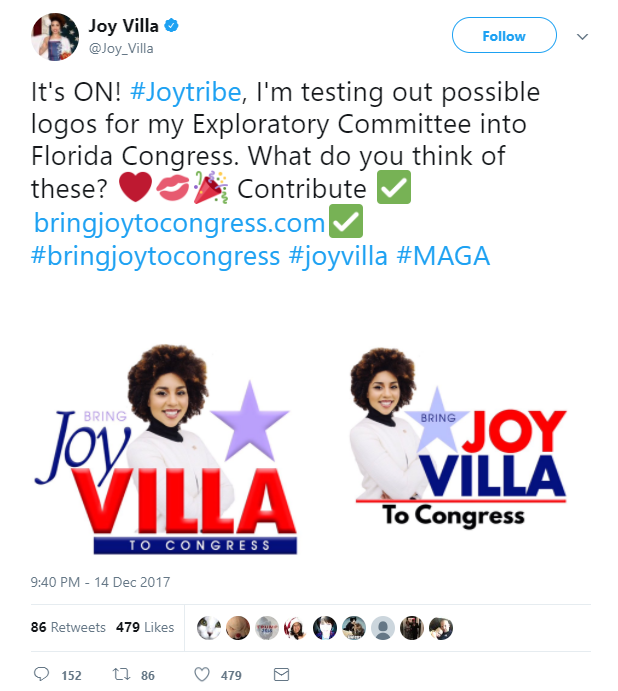 Is there any conceivable way that Joy Villa would run in the Republican primary for the 13th Congressional District, which includes Clearwater and the Scientology Flag Land Base, and rely on Trump, MAGA and (stealth) Scientology support? Ivanka Trump "actually pulled me aside and said, ‘I really want you to run. We need more strong women to back up, you know, what America needs,’" said Scientology member Joy Villa about her potential run for Congress. 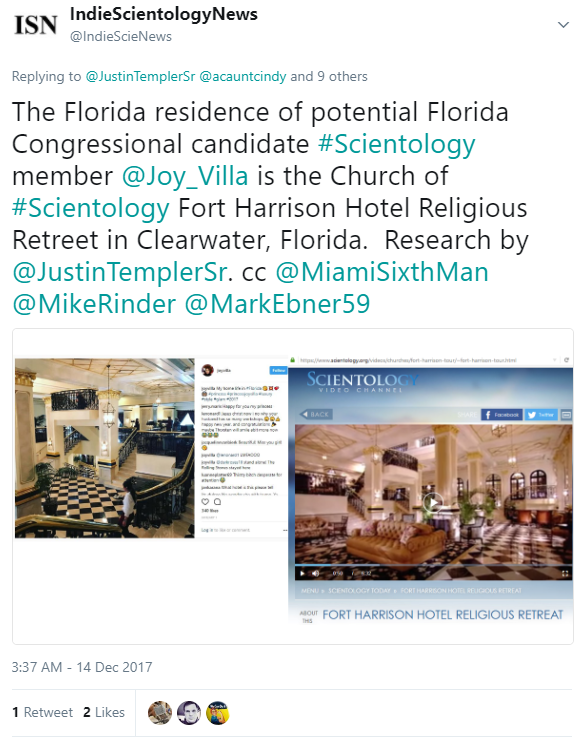 The Florida residence of potential Florida Congressional candidate Scientology member Joy Villa is the Church of Scientology Fort Harrison Hotel Religious Retreet in Clearwater, Florida. Research by @JustinTemplerSr. Corporation information for Joy Villa's exploratory committee, Bring Joy To Congress Exploratory Committee Inc. The only listed officer is the Treasurer, Randall Woodruff. I know there is a Woodruff family that is heavily involved in Scientology, but I don't know if he is related. The only address for the corporation, 5471 Spring Hill Dr., Spring HIll, FL 34606, is he address of Suncoast CPA Group and Suncoast Wealth Management Group, LLC. Maybe anti-Scientology sentiment has not evolved to the level of actively demanding the Government crack down on it, but the C of S is distrusted enough to the point where hardly anybody is going to positively back her. In a month no one will remember her. Joy Villa is testing out possible logos for her Exploratory Committee for a Congressional run. Fox News is REALLY pushing Joy Villa. Here is Villa being interviewed on Fox Business. You have to go to the tweet to see the video. As I indicated, Fox News is seriously pushing Joy Villa. 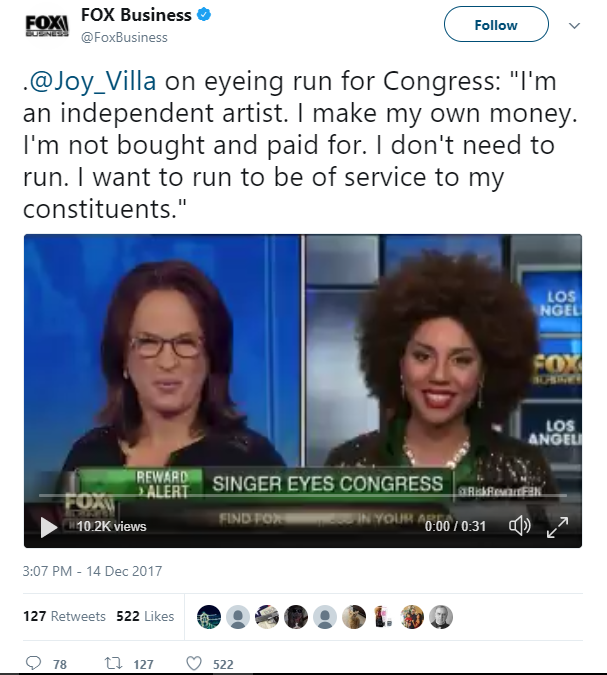 Fox Business YouTube channel: Singer Joy Villa weighs Florida congressional run. 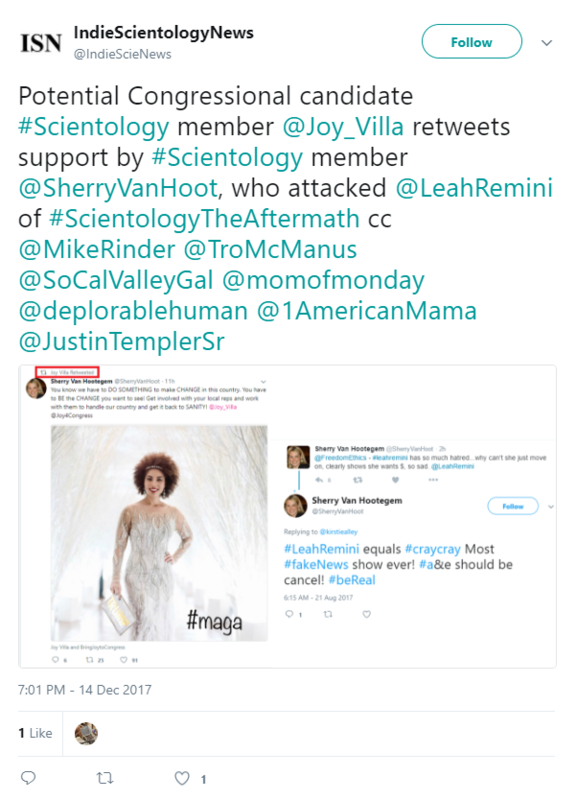 Potential Congressional candidate Scientology member Joy Villa retweets enrosement by Scientology member Sherry Van Hootegem, who attacked Leah Remini of Scientology and the Aftermath. As always, quotations adding content, retweets and replies welcome. 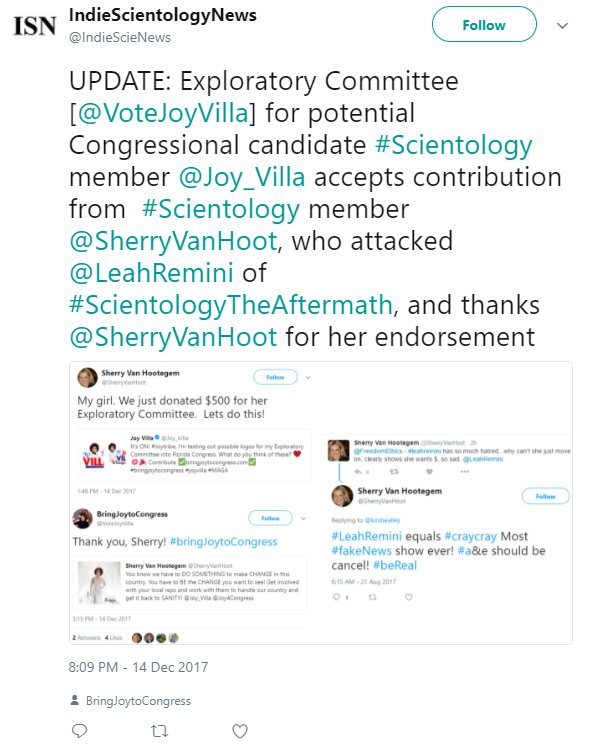 UPDATE: Exploratory Committee [@VoteJoyVilla] for potential Congressional candidate Scientology member Joy Villa accepts contribution from Scientology member Sherry Van Hootegem, who attacked Leah Remini of Scientology and the Aftermath, and thanks Hootegem for her endorsement. As always, quotations adding comments, retweets and replies welcome. 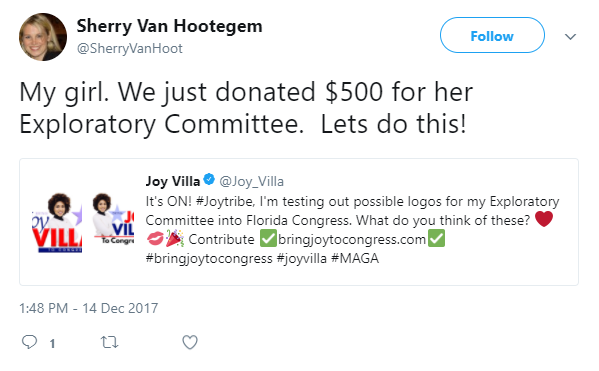 is the poster "communicator ic" trying to promote joy villa on here? Joy's dreams of a political career are exponentially more absurd that L. Ron Hubbard's dreams of becoming the political leader of Rhodesia. At least Hubbard had money and was a published writer with a cult backing him. And he went down in humiliating flames, getting booted out of that country when they quickly caught on to his pathetic con game. In a contested (i.e. 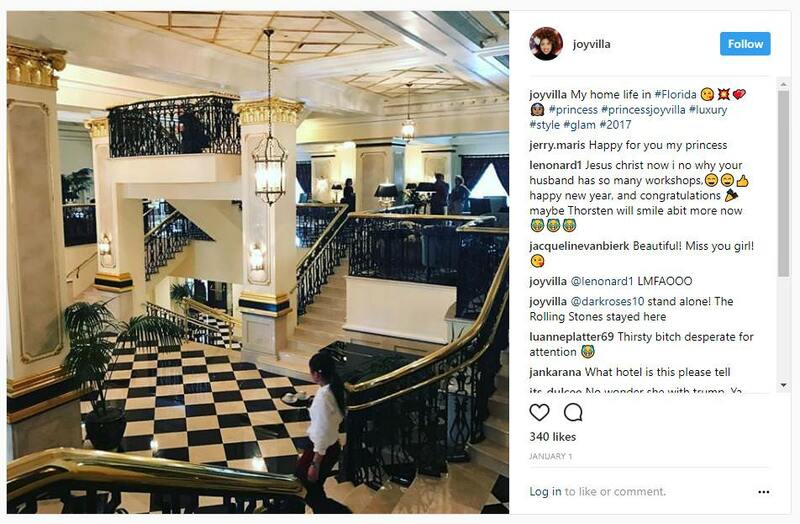 opposed) race for a congressional seat, Joy is going to discover that she is going to be FORCED to answer questions about Scientology and their beliefs/practices. Unless she is running against another Scientologist, public voters are going to get spooked with a fatal dose of Heeber Jeebies. 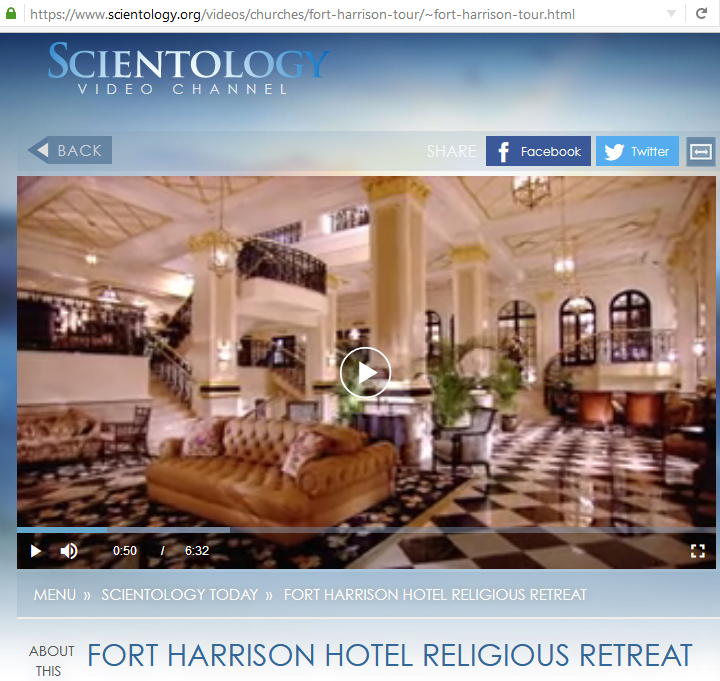 Scientologists are not electable as long as there is the internet. your savior and the son of God, or not? "Jesus For Joy" t-shirt at huge unprecedented discounts too!